Bullpen Research & Consulting and Batory Management just published their Q4-2018 High-Rise Land Insights Report for the Greater Toronto Area. 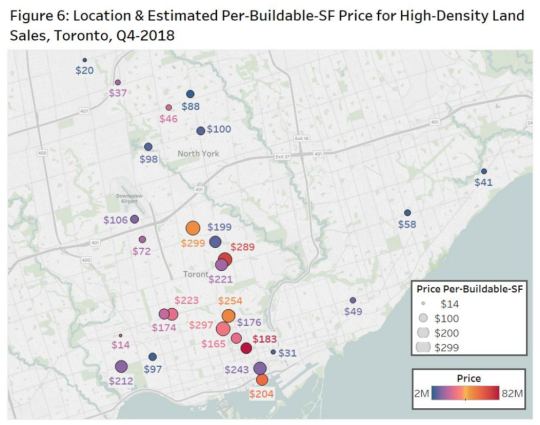 Above is a mapping of the estimated per square foot buildable prices for the land that traded hands specifically in Toronto last quarter. The average is $178 per square foot. And the projected average sale (condo) price is $1,097 psf. That sounds right. You basically need that kind of end pricing to make the math work with today’s costs. Across the GTA, the average spread between zoned and unzoned land was almost $40 psf. $159 psf versus $120 psf, respectively. A full copy of the report can be downloaded here.